The fight against the $7.6 billion New York nuclear bailout isn’t over. Not by a long shot. NIRS and a coalition of New York groups are working to overturn it, and put the state on the path to nuclear-free, carbon-free renewable energy. 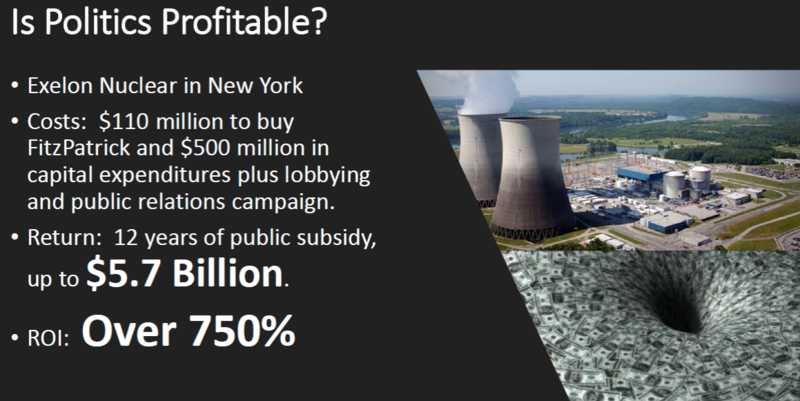 New Yorkers are paying $40 million every month to subsidize nuclear power – over $480 million in the first year alone, nearly 200 times as much as the state is spending to develop renewable energy. And the nuclear costs will take a big jump in April 2019, because the subsidy is scheduled to increase every two years – even while solar and wind power keep getting cheaper and cheaper. We won’t let this go on for another 11 years. It’s not just that subsidizing dirty, old nuclear reactors is a dangerous, hypocritical waste of money — which it definitely is. It’s not just that it’s a cynical ploy to nuclear corporations by burdening every person, household, town, school, and business in the state with higher electricity costs. It’s that the NY Public Service Commission had to break the rules to create the bailout to begin with. The PSC rushed to approve the subsidies without giving New Yorkers the required time to find out about the bailout and make themselves heard on it. That’s not the way good decisions are made, and that’s why New York has laws that should have prevented it from happening to begin with. As soon as people found out about the bailout, the whole state was outraged. But too late–it was already approved. NIRS is taking action to enforce the law and overturn the bailout. We are going up against the largest utilities and nuclear corporations in the country, but we have them right where we want them. The truth is on our side, and the record is clear. We need your support to see this campaign through. If we win, we can stop the bailout, phase out nuclear power in New York, and show the rest of the country that it was an unjustified mistake. And most importantly, phase out nuclear power and accelerate the transition to 100% renewable energy. Does lobbying pay? Ex-Exelon exec highlights former employer as poster child.